"Monet on Monterey" Monterey, California. I made an adjustment to smooth over the texture of the clouds that I think gives the photograph an added artistic perspective. For a week I was shooting along the Pacific Ocean from Pebble Beach to Monterey. On my last day I was shooting the Lone Cypress Tree on 17 Mile Drive- Pebble Beach. I had to leave before sunset to pick up some friends flying into the San Francisco airport. While I was driving, on Highway 101, past Monterey headed to the San Francisco airport the sky had just started to change and develop into these colors. 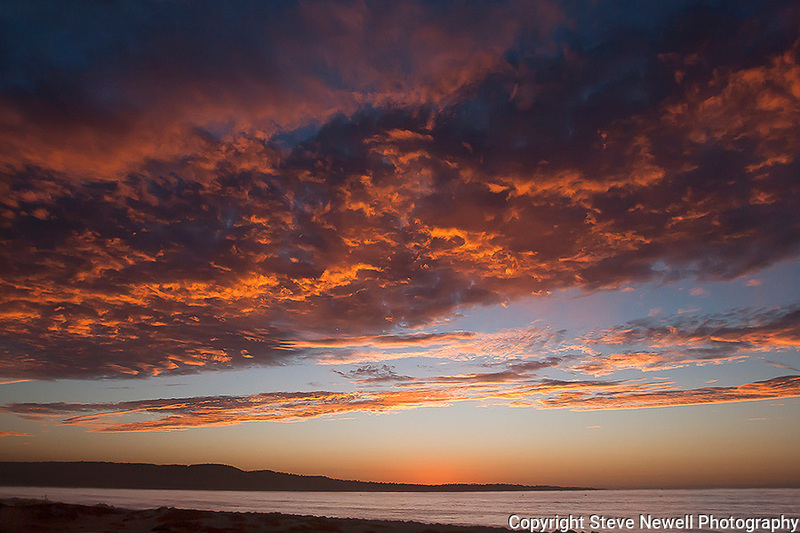 I pulled off at the next exit, parked asap, and ran to the beach just in time to capture this Monterey Bay sunset. I couldn't help lamenting that I could have captured this sunset at the Lone Cypress Tree ... I guess friends first will last longer than a sunset.